Black women continue to give birth to low birth weight babies and black babies continue to have the highest infant mortality rates than any other race in America. That said, it’s extremely imperative that you get as much prenatal attention as possible, not only for your health but also for the health of your baby. In addition to attending regular pre-natal visits, you can always do supplemental reading about your pregnancy. 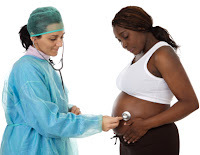 We recommend womens-health.gov’s prenatal information. Not only do they have essential information on their site, you can also call them toll-free to speak to a real person. Click here for additional information about having a healthy pregnancy.